DENVER -- Edible marijuana products in Colorado may soon come labeled with a red stop sign, according to a draft of new rules released Wednesday by state marijuana regulators. The state may also ban the word "candy" from edible pot products, even if they're sweets such as suckers or gummy chews. The new pot symbol -- an octagon stop-sign shape with the letters "THC" to indicate marijuana's psychoactive ingredient -- would have to be on individual edible items, not just labels. Liquid marijuana products would be limited to single-serve packaging, defined as 10 milligrams of THC. "It's time we have a tool to really let people know there is pot in something," said Diane Carlson of Smart Colorado, a parents' group that has pushed for giving edible pot a distinct look. Regulators rejected an earlier proposal to mark edible pot with a weed-leaf symbol after parents complained the symbol would simply attract children, not dissuade them from eating the products. Also banned under the proposed rules: pre-made edible items. The rules would ban a manufacturer from buying bulk candy and spraying it with cannabis oil, but not altering an existing product so that it's unrecognizable, such as grinding up chocolate chip cookies to make a cheesecake crust. But manufacturers complained that the made-from-scratch rule needs more clarification because manufacturers routinely use pre-made products. "Do I have to have chickens out back for the eggs?" asked Dan Anglin of the Colorado Cannabis Chamber of Commerce. 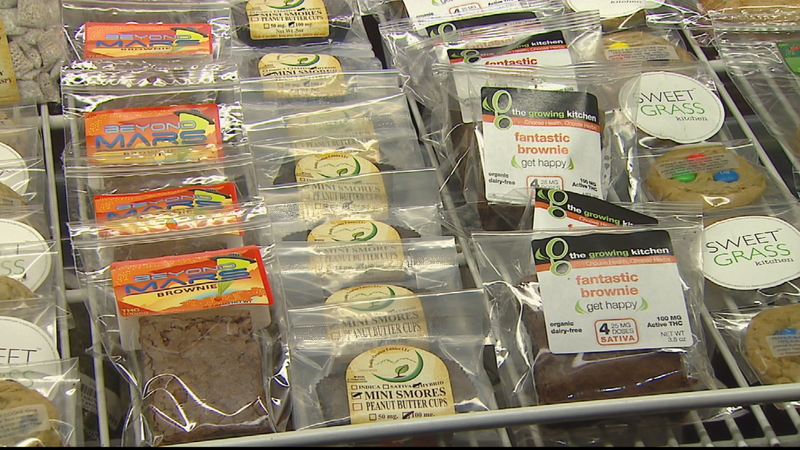 The proposed rules were released as the Colorado Marijuana Enforcement Division works on new guidelines for edible marijuana, which can be baked into cookies or brownies or added to a dizzying array of items from sodas, to pasta sauces, to granolas. The agency tried and failed last year to implement a requirement that edible marijuana have a distinct look when outside of its packaging, a requirement passed by state lawmakers last year amid concerns that some people were accidentally eating food infused with marijuana. The state already bans pot manufacturers from using cartoon characters on packaging or making "look-alike" products such as candies designed to mimic common foods. But the state has seen sporadic reports of people unknowingly eating pot. Perhaps most famous was a man hospitalized after unknowingly eating pot-infused chocolate at the 2014 Denver County Fair. The new edible-pot rules face a public hearing before final adoption. Marijuana regulators in Colorado have until January to implement a 2014 law requiring edible marijuana to have a distinct look when outside its packaging. The agency tried but failed to come up with those rules last year after several meetings with pot manufacturers. The manufacturers complained that the law - which requires edible to be "stamped, shaped, colored or otherwise marked" that it is not for consumption by children - would be unwieldy when it comes to liquid products or anything besides hard candies or cookies. In response, the state Health Department last year suggested banning all edible marijuana except for lozenges or other items that could be easily stamped. The proposal was quickly withdrawn after the industry and consumers complained. The sponsor of the law requiring a distinct look for edible pot called the stop-sign symbol and the "candy" label ban appropriate steps to address concerns that pot candies can tempt kids who don't know it's a product that intoxicate them. "I don't think that items that aren't attractive to kids like granola and salad dressing need to be held to the same high standard of marking, stamping or coloring," said Rep. Jonathan Singer, D-Longmont. "I'd like to see hard and fast rules for items that are attractive to kids and exceptions for others." Edible marijuana makers on a state panel reviewing the rules argued that childproof packaging and clear labels are sufficient to keep kids out of edible pot, and that once out of the package, the manufacturers should not be responsible for how they're stored. One cookie maker said she'd rather see the "THC" label in a circle, not a stop-sign shape. "A stop sign sends the message that THC is bad. That says, 'Stay away,' " said Julie Berliner, CEO of Sweet Grass Kitchen, which makes marijuana-infused cookies. Colorado dispensaries last year launched a "First Time 5" campaign of posters to encourage new users to take a 5 milligram half-dose of marijuana to make sure they don't overdo it. A marijuana advocacy group has taken out billboards and magazine ads with the tagline "Start Low, Go Slow."